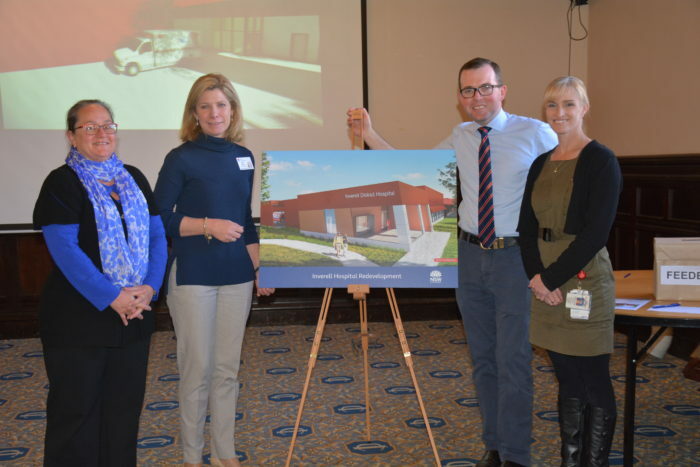 Member for Northern Tablelands Adam Marshall gives his feedback with redevelopment Change officer Kate McCosker, HNE Regional Health Service Executive Director Susan Heyman and Inverell Health Services Manager Kath Randall. MORE than 100 Inverell locals passionate about furthering their district’s health services have shared their thoughts with teams leading the Inverell Hospital redevelopment, helping to make their mark on the $30 million overhaul. Member for Northern Tablelands Adam Marshall joined the community at last Friday’s consultation session in Inverell, speaking with locals and the development team about the once in a generation upgrade. “At least 25 people passed through while I was at the Inverell Club on Friday morning, sharing their thoughts, concerns and ideas for the upcoming project,” Mr Marshall said. “With over 50 arriving as the doors opened, it’s clear word of mouth has been huge. “After years fought fighting for this redevelopment, this is truly the community’s hospital – and I’m glad to see the passion displayed by many is stronger than ever. The local MP said his discussions with representatives from NSW Health Infrastructure and Hunter New England Health about the feedback revealed it to be overwhelmingly positive. “The vast majority of the feedback received from the community has been positive – with so many keen to see designs and artist’s impressions ahead of time,” Mr Marshall said. “I saw many locals formalise their thoughts with a written note to the project team, and NSW Health Infrastructure were keenly writing notes during their many discussions with locals.